Champion Oil, a respected leader in the world of chemicals and lubricants, announced today the addition of three high-octane leaded race fuels for all segments of amateur and professional motorsports. The new Champion Race Fuels, are available in 111, 114 and 118 motor octane ratings and are designed for competition engines routinely operating from green to checker with high rpm, high compression, heavy load, or sustained speed. The Champion Race Fuels are blended to achieve a high motor octane number and fast burn speed to ensure engine protection. These fuels are not street legal and are intended for off-road and racing use only. 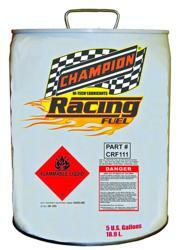 Champion Race Fuels are competitively priced in 5-gallon containers and 55-gallon drums and available through Champion Distribution or F.O.B. Clinton, MO.